Best Camping Lights - Top Flashlights, Headlamps, Lanterns, and Solar - Reviewed. The best outdoor camping lights: lanterns, headlamps, flashlights and more! best camping lights: reviewed, tested, ranked. Searching for the best camping lights: flashlights, headlamps, lanterns, solar or battery-powered? You can’t camp without a great light. It’s one of those essential items that everyone has in their camping checklist. But that’s not to say all camping lights are created equal. Sure, you can pick up a $5 flashlight at the corner store. But when you’re in the backcountry, or car camping in Denali, a flickering cheapo won’t cut it. You need a reliable, bright, and versatile camping light. What options are available for outdoor camping lights? Some swear by the trusty flashlight, while others prefer a hands-free headlamp. Bottom line, if it puts out a pool of bright light, reliably, then it’s worthy of consideration. 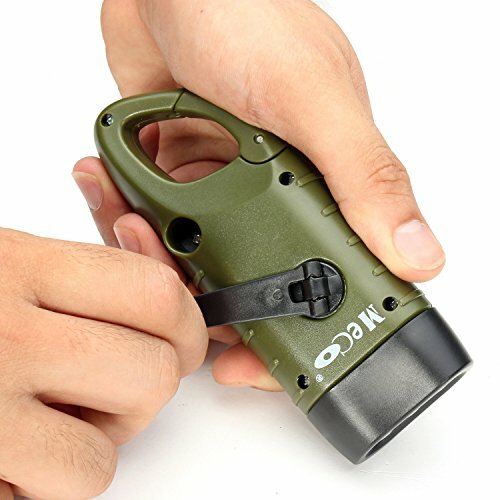 Best Camping Flashlights – Great tactical flashlights are lightweight, and allow campers to adjust light output and better focus the light beam. Flashlights are the ol’ reliable in your camping gear stash. Best Camping Headlamps – Headlamps keep your hands free, and they’re perfect for backcountry camping. You can set up your tent, hit the trail early in the morning, or rummage through your gear in the dark easier with a great headlamp. Best Camping Lanterns – A great lantern is like a portable table lamp. Great for providing light at your campsite or illuminating your tent, lanterns are perfect when you need a broad and bright pool of light. Best Solar Lights for Camping – Each year gear shops put out new innovative lighting systems. Solar camping lights are all over the marketplace now, and they’re perfect for longer trips. Flashlights have come a long way! Today’s tactical camping flashlights are brighter, smaller and handier than ever. These aren’t those lights you took with you trick-or-treating. What’s great about the S1? For starters, the light a bright, sprawling pool of light. Six hundred lumens to be exact. Plus, it includes a Micro-USB rechargeable battery, which gets great life (especially in the lower settings). At 0.5 lumens, a fraction of its total output, you can expect about 25 days of performance. But what’s really great about the S1 is the light’s tiny footprint. 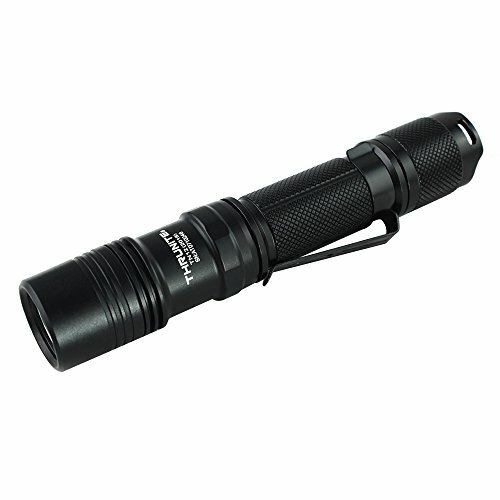 It’s the most compact RCR123A battery compatible flashlights on the market. Measuring just 2.5 inches, the light is about the size of a roll of quarters. Pros: A tiny, compact light that puts out big, bright light. In its lower settings, the light gets great battery life, although it’s below-average if you’re cranking out 600 lumens. Cons: It’s got some girth. That makes it difficult to stow in your pocket. Plus, there are a lot of settings; you might end up toggling through a few before you get the hang of it. Final Verdict: For a tiny handheld flashlight, it doesn’t get much better than the Olight S1. 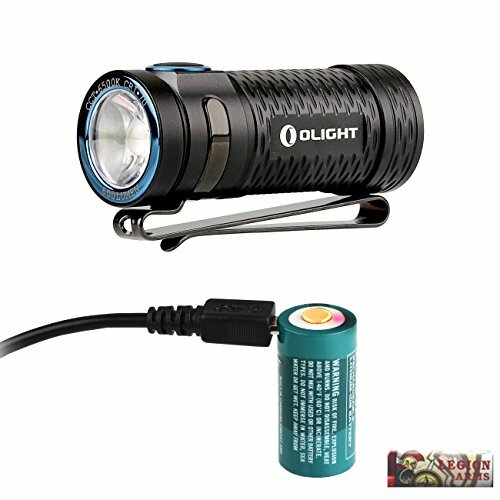 >> Learn how to buy the Olight S1 Flashlight! The A1S hits all the right notes for a camping flashlight. It’s extremely bright, with a 1150-lumen rating, and it puts off a beam of bright light up to 900+ feet. What’s more: It’s completely waterproof, and has been tested in water up to 1.5 meters deep. The A1S is also well designed. It’s super slim, measuring just 1 inch in diameter and 5 inches in length. You also get a bunch of tactical features, including a strike bezel, a red lens cap, and a 3400mAh USB rechargeable battery. Pros: The battery life is off the charts. Charge it once and use it for months. Plus, the red-light cap is a nice touch; it will save your eyes at night around camp. Cons: There isn’t a AAA battery option. That’s a problem if you’re not near a charging port. Final Verdict: The A1S puts off tons of brilliant bright light; it’s the perfect tactical light. 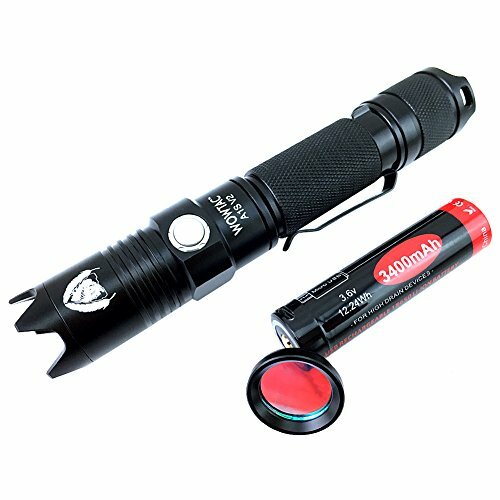 >> Learn how to buy the Wowtac Flashlight! With a flashlight, a bright pool of light is the goal. And that’s where the Fenix PD35 delivers. The small, hand-held torch emits 1000 lumens of LED light, but it’s easy to adjust brightness, depending on your application. 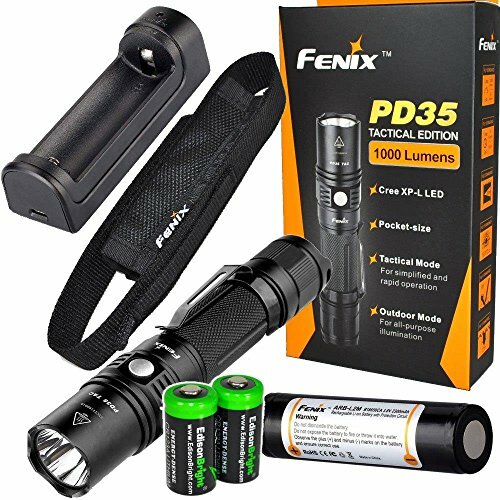 Another great feature: The PD35 is compatible with both an 18650 mAh rechargeable battery or two 3V CR123A lithium batteries. So, you can go with store-bought batteries or use an 18650 you already own. What’s really great about the Fenix, though, is it’s waterproofing. It still functions after spending 30 minutes in 6.5 feet of water. So, if you’re going out in rainy conditions, this is the light for you. Finally, it has heavy-duty construction, made from aircraft-grade aluminum. Pros: The lighting is current regulated. That means the light holds its brightness, even as the battery depletes. You won’t get that subtle fade as the batteries die. Cons: The red-light lens is sold separately. Plus, there are so many settings, it can take a minute to learn how to program it. Final Verdict: The AS1 matches high-quality construction with great performance; one of the best flashlights on the market. >> Learn how to buy the EdisonBright Flashlight! The TN12 is a powerful little flashlight that’s perfect for camping. For one, it produces loads of light. At its highest setting (1100 lumens), you get a nice pool of hot light with plenty of flood, and you can choose a neutral white or cool white color tint. In terms of performance, there are several brightness levels, and the light, compared to others, is super user-friendly. You can quickly toggle through settings. Plus, the build quality is great. It’s made from lightweight anodized aluminum with knurling grip, a slight strike bezel, and a beam focus adjuster. Pros: The light in its highest setting is incredible. You get tons of brilliant light. But even in dimmer settings, the light is perfect. The TN12 is also extremely efficient. Cons: The light gets hot when in use for extended periods. That’s especially true in its highest setting. Final Verdict: Use this light for backcountry treks when you need lots of brilliant light. Backpackers love headlamps. And for good reason. A trusty headlamp provides hands-free lighting. That’s useful when you’re setting up camp after dark, taking off before sunrise, or just maneuvering around camp in the dark. 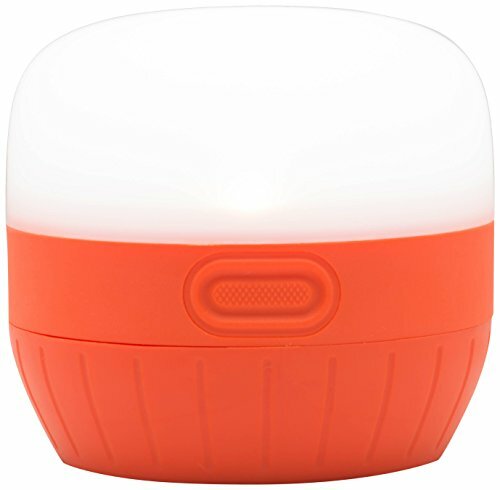 The Spot is one of Black Diamond’s flagship lamps, and it’s a handy little light for backpackers, hikers and climbers. For starters, the sturdy strap feels secure, even if you’re running it won’t feel loose. Plus, the Spot has two handy lighting modes. There’s Proximity for close work (e.g. setting up camp) and Distance which stretches the beam up to 80 meters. Overall, the lamp is versatile. It has a low-profile bulb that’s adjustable and powered by three AAA batteries. Battery life is great; up to 175 hours at the lower settings. Plus, the lamp’s PowerTap Technology, allows you to toggle brightness settings with a single touch. Pros: The Spot sits securely on your forehead. That makes it good for runners. Plus, it’s waterproofed and emits a great flood beam with a wide angle. Cons: In Proximity mode, the beam does have a distinctive yellow bulls-eye spot. That’s distracting for some. Plus, the comfort is OK, but could be better. The lamp can feel bulky on the forehead. Final Verdict: The Spot offers great performance at an incredible value. Plus, it stays in place – even if you’re running. >> Learn how to buy the Black Diamond Headlamp! Petzl is one of the most recognizable names in camping lights, and the Tikka is one of its classic lamps. It’s built for trekkers and outdoor enthusiasts, and it has useful features like the red-light mode that campers will love. Plus, it’s super comfortable. The Tikka is easy to adjust, the lamp sits lightly on the forehead with a bit of padding, and it stays securely in place. A few other notes: the Tikka runs on three AAA batteries (or a CORE rechargeable), it’s super simple to operate, and the lamp face glows in the dark, which makes it easy to find at night. Pros: The Tikka is one of the most user-friendly headlamps on the market. Transitioning between settings is super simple, it’s extremely easy to adjust the straps, and it’s comfortable. Cons: At 200 lumens, you aren’t getting a super-bright torch. But that does maximize battery life. In its lowest settings, you can run it for 10 days. Final Verdict: Get the Tikka for long-lasting performance and useful trail features. 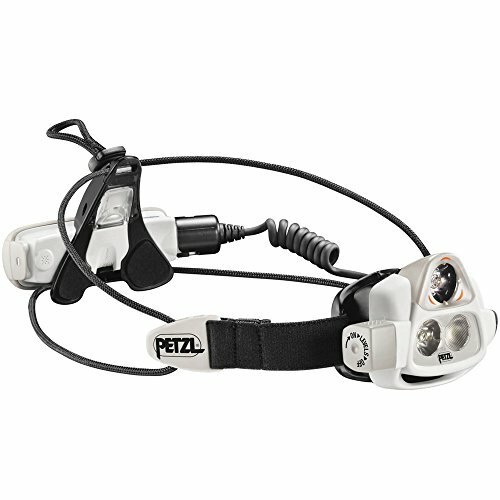 >> Learn how to buy the Petzl Headlamp! The HL8 is a heavy-duty piece of trail hardware, and it’s got a bunch of awesome features to back that claim up. For starters, the HL8 is built tough. It’s impact-resistant, water-resistant, and backed by a Lifetime Warranty. Yet, the ease of toggling makes this one of the best. Both the beam focus and brightness settings are controlled via separate twisting wheels. You can quickly focus the beam – transitioning from a wide-angle flood to a bulls-eye spot. Plus, you can twist to achieve a brighter or dimmer light. That makes it super easy to use. Not to mention, at 615 lumens, the HL8 is brilliantly bright. Pro: The comfort is great. The HL8 features a classic top strap design, which adds support. Plus, the light is easy to adjust via the twisting toggles. There is no learning curve in figuring this one out. Cons: The HL8 is powered by four AA batteries, which are housed in a detachable pack. The pack does have a 3-foot cord, but it can be a pain to position. There is no red-light mode either. Final Verdict: The HL8 is easy to use, hard-hat compatible, and it’s super-bright; that makes it perfect for work or play. This is an awesome headlamp for beginners, intermediate and expert outdoor adventurers. 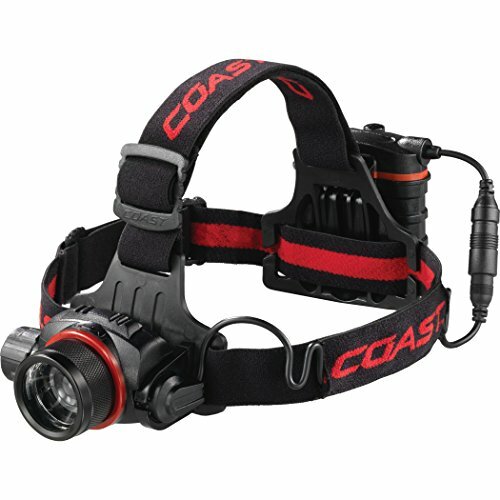 >> Learn how to buy the Coast Headlamp! All of our devices are getting smarter. Why not have a intelligent headlamp? Well, that’s exactly what the Nao+ is. It’s an app-connected, Bluetooth-enabled headlamp with tons of high-tech features. But don’t let that fool you. At its core, the Nao+ is a headlamp designed for athletes. Here’s what’s great: the Nao+ features Reactive Lighting. It auto-adjusts brightness based on what you’re doing. Plus, Constant Lighting tech gives it a bright beam, even with low batteries. The best feature though is connectivity with the MyPetzl Light app. Through the app, users can monitor battery levels (it’s a micro-USB rechargeable), set custom profiles, monitor usage, and more. It’s great in terms of performance too. For a 750-lumen lamp, the Nao+ receives about 6.5 hours of use at its highest setting. And a flashing rear-facing red light lets people know where you are (great for night cycling in the city). Pros: The Reactive Lighting is super useful, and helps better manage battery life. And the MyPetzl Light app gives you tons of useful features. You can specify how long you need it to run for, optimize battery usage, adjust brightness and more. Cons: The app connectivity isn’t much help for thru-hikers (and probably not worth the added expense). Plus, the battery life for the lower settings could be improved. Final Verdict: The Nao+ is the perfect choice for tech-savvy outdoor enthusiasts. 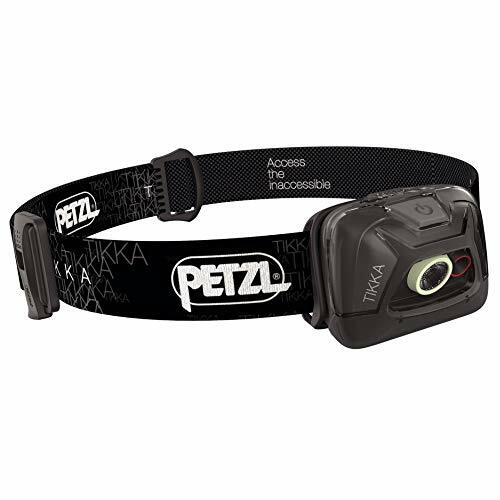 >> Learn how to buy the Petzl Nao Headlamp! A great lantern is a versatile tool. It bathes your campsite or tent in light and makes it easy to see your surroundings. If you’re car camping, or backpacking, there’s a lantern that fits your needs. The Lighthouse looks like a pared down version of the classic camping lantern. It’s got legs and a handle. You can hang it, stand it, or carry it. But this is certainly a modern lantern. For starters, the Lighthouse operates as a USB hub. Charge a tablet or smartphone wherever you are with it with it. Plus, the light is solar ready. With a solar pad (sold separately), you can charge it in the backcountry. In terms of performance, this is a great light too. The Duralite Direction Lighting produces 360 degrees of bright light, and the internal 4,400 mAh battery delivers long-lasting light. Pros: You can use one or two sides of the light. One side is great for hiking. The legs fold in, so it stows perfectly. Plus, it has a small footprint. Cons: The Lighthouse’s dimming buttons are small and forward facing. If you’ve got big hands, they can be difficult to adjust. Final Verdict: A great lantern/charging hub, the Lighthouse provides a sprawling pool of light at the campsite. >> Learn how to buy the Best Lantern in the World! The Moji is one of the best backpacking lanterns on the market. It’s small and fits in the palm of your hand. Plus, it’s super useful, providing a large six-meter spread of light. It’s the perfect tent light. The double hooks fold out from the top and can attach inside your tent. 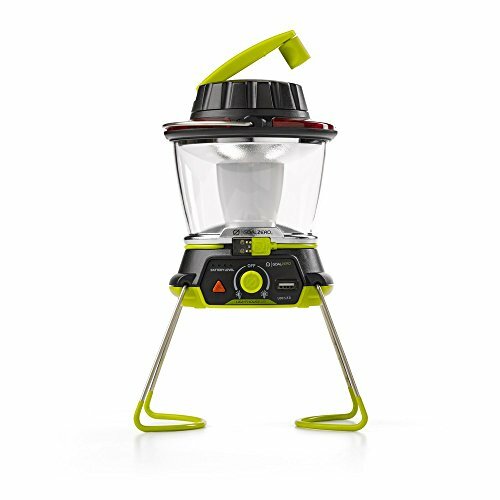 Plus, this outdoor lantern is powered by three AAA batteries, and gets plenty of battery life. If you’re traveling in rough conditions, the Moji is also water resistant. Pros: Small and lightweight! This is perfect for backpacking. The light works great as a tent light or area light in camp. Cons: At 100 lumens, it’s not very bright (but does the job at night). Final Verdict: The Moji is the go-anywhere lantern – perfect for thru-hikers and long overnights. >> Learn how to buy the Black Diamond Lantern! Here’s the Duro Glow’s claim to fame: it can run in its low-light mode for 30 days. But even in its highest setting (700 lumens) the light runs for 22 hours. That’s great battery life from a larger lantern. The Duro Glow has four light settings – high, medium, low and SOS – and it’s fairly light, weighing just 1.1 pounds. A great feature: the globe is removable, and using the bottom fold-in hanging hooks, you can hang the globeless directional light just about anywhere. Pros: Incredible battery life. Many testers say it nails the 30-day claim, or comes pretty close. Plus, the build quality is great. It’s lightweight but doesn’t feel cheap. Cons: The Duro Glow can turn on easily. That can be a problem when you stow it or in cramped tents. Final Verdict: The Duro Glow is a lantern you’ll use for camping, but keep it handy around the house. >> Learn how to buy the UST Duro Glow Lantern! The Super Bright is a versatile lamp. It’s part lantern, part search light, and it operates as a USB hub as well. Although it might be too bulky for a backpacking trip, it’s perfect for car-camping adventures, or just around the house during a power outage. The Super Bright is sleekly designed. It has a handle, with a stowable charging cable. The light is powered by rechargeable lithium ion batteries, and a helpful charging meter lets you know how much juice you have left. 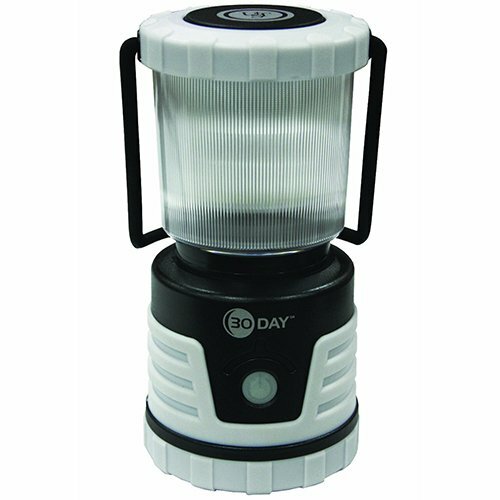 As a search light, the Super Bright puts out a brilliant beam that’s great for hiking, and the lantern can be used in 180- or 360-degree modes around camp. Plus, it comes with a shoulder strap. Pros: Super versatile. With this lantern, you can leave your flashlight and mobile USB hub at home. Plus, the design is sleek and it carries nicely thanks to the shoulder strap. Cons: Build quality could be better. It feels a little cheap. Final Verdict: The Super Bright is one piece of gear you can leave in your car. Great for camping and roadside emergencies. Solar lights are survivalist must-owns. These lights utilize solar energy to recharge, and they’re great for thru-hikes, backcountry living, or just for saving you on batteries. This flashlight from MECO is a handy tool if you find yourself in a pinch. It can be charged two ways: via the built-in solar panel, or with the easy hand-crank. The crank works great. Crank six minutes for an hour of light. The solar panel is great too; depending on the sunlight you can charge the light full in a couple of hours. Plus, it’s well designed, fits in the palm of your hand and has a bottom carabiner to clip anywhere. Bottom line, this won’t replace a quality LED flashlight, but if you’re out of batteries, it’s a useful tool for your pack. Pros: Easy to power. Crank for a few minutes and get a half hour of light. The solar charging is efficient too. Cons: It’s not the brightest, just 40 lumens, which is what you might expect from a keychain light. Final Verdict: The MECO is a great solar- and hand-powered emergency flashlight. >> Learn how to buy the MECO Solar Powered Flashlight. The Luci is a handy inflatable solar lantern, and it earns high marks for its brightness and durability. It’s simple to use. Just leave it in the sun, and when you’re ready, blow it up and turn it on. The Luci gets high marks for efficiency. Just 6 hours in the sun results in about 10 hours of operation. 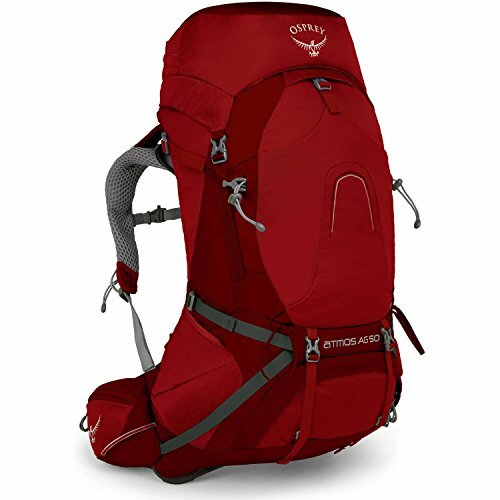 That’s plenty, especially if you strap it to your pack to charge it while you hike. What’s more, it’s completely waterproof, which makes it a great for kayaking or canoe trips. Pros: The Luci is durable and made from a sturdy vinyl. It’s also bright and charges efficiently. Cons: Over time, the battery can lose its ability to hold a full charge. You might have to charge it longer after 2-3 years. Final: The Luci folds down to the size of a hockey puck; that makes it great for backpacking. 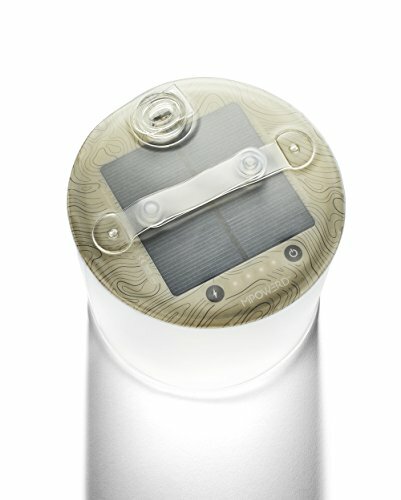 >> Learn how to buy the MPOWERD Solar Lantern. LuminAID might sound familiar. The company scored a deal on Shark Tank for their portable, inflatable solar lanterns. The Parklite Nova, for example, hits all the right marks. It’s super-lightweight, weighing just 5 oz, and it packs down to about one inch thick. It might not be the brightest light, with its 75-lumen rating, but that’s enough for dark nights in camp. Plus, the solar panel works well. It takes about 10 hours for a full charge, which runs about 15 hours. And if you want a backup, some models are USB chargeable. Pro: Collapsible and super-lightweight. This stows perfectly in a corner of your backpack. The light is also waterproof and it floats too. Cons: The Parklite Nova is slow to charge if you’ve drained the battery. It’s better to charge it before it’s fully depleted. Plus, it’s a one-button light. You have to toggle between tons of settings to find the one you want. Final Verdict: For survivalist or campers, the Parklite Nova puts off just the right amount of light on a solar charge. 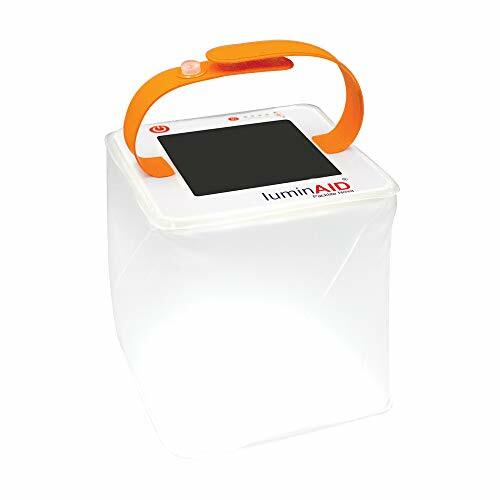 >> Learn how to buy the LuminAID Solar Lantern! Ready to Buy the Best Camping Lights… Awesome! 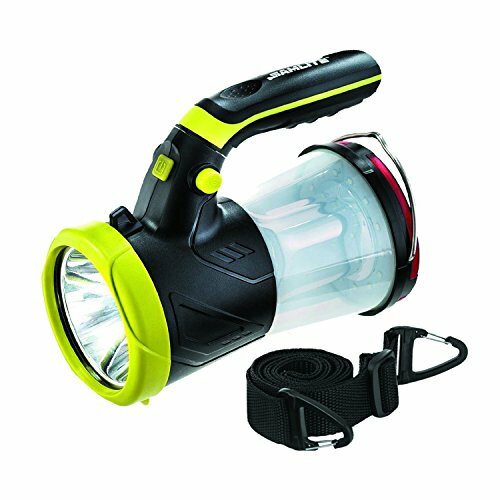 Whether you’re looking for a light for your next hiking, camping backpacking trip, or just something to keep around the house, any one of great these flashlights, headlamps and lanterns will do the trick. We poured over hundreds of products, and we can say, these represent the creme de la creme. Are we missing your favorite outdoor light? Let us know. Connect with Angel Outdoors on social media to stay in touch.